North Texas Giving Day, powered by Communities Foundation of Texas, is an 18-hour online giving event designed to empower every person to give back to their community by supporting local nonprofits and causes they care about in one easy step. The annual event has seen nine years of incredible growth, raising $39 Million in 2017! The largest community-wide giving event in the nation, what began as an idea to raise awareness of nonprofits has become a movement, igniting a broad culture of community-wide giving. This year’s event on September 20, 2018 will mark ten years of supporting local non-profits and sending much-needed funds back into our community. There are many great causes across North Texas registered on the North Texas Giving Day website. Simply visit the event web page, find a charity you would like to support…and make your donation or create a fundraising page! But if you would like to focus your dollars in Frisco, Lifestyle Frisco’s Give For Frisco platform can help you efficiently identify non-profits who are based in Frisco or serve the Frisco community. It’s your one-stop-shop to discover organizations who care about the Frisco community as much as you do. Of the 40 Frisco-centric organizations featured on the Give For Frisco platform, most are registered for North Texas Giving Day. 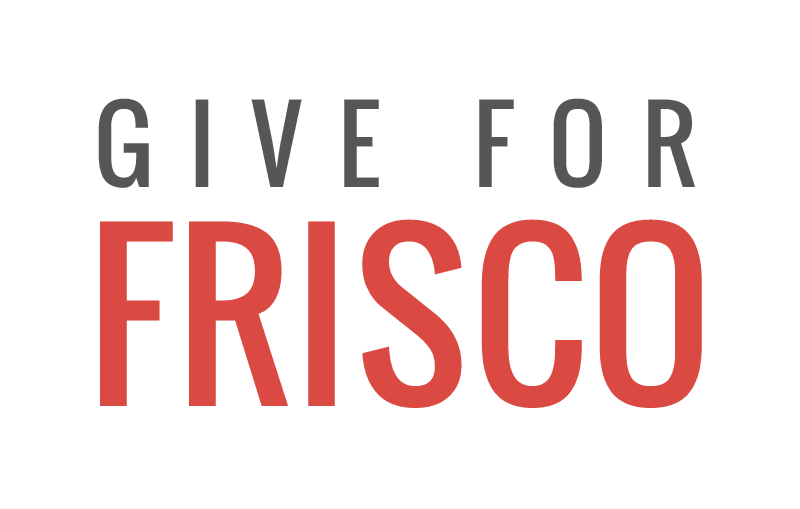 Review the Give for Frisco organizations, below, to learn more about each nonprofit, and the causes they serve. Then, schedule your donation for 2018 North Texas Giving Day! While monetary contributions are greatly appreciated, Give For Frisco also includes a “volunteer” link where applicable. Giving of your time is also an invaluable way to impact our community! Frisco Association for the Arts (Frisco Arts) is the city’s official arts advocacy agency whose mission it is to advance the arts in Frisco by raising the visibility of the arts in our community. Additionally, Frisco Arts has awarded over $50K in scholarships to students pursuing a career in the arts. The Visual Arts Guild of Frisco is dedicated to promoting the visual arts and educating the public by hosting numerous art exhibits, workshops and educational lectures for guild members and the public. Melody of Hope exists to financially support and become an advocate for area nonprofit organizations through benefit concerts across DFW. Through relationships with artists, venues, and sponsorships, MOH ensures ticket sales and donations go to the highlighted charity while educating concertgoers on more ways to get involved. Dale Clark Scholarship in Advancement of Women awards a scholarship to a woman with unconventional leadership qualities to attend the Marsha Clark & Associates “Power of Self” program. The scholarship recipient will participate in the year-long program at no cost to her, other than travel, lodging, and meals. Leadership Prep School (LPS) is a highly regarded charter school in Frisco, Texas now in its seventh year of operation. The mission of LPS is to inspire students to learn, grow, and lead for a lifetime. The acronym P.L.A.C.E. summarizes the five key areas that have been selected as the focus of LPS’ vision: Parent partnership, Leadership development, Academics, Creativity, and Excellence. Leadership Prep School – North Texas Giving Day. The YMCA Mission Statement is to put Christian values into practice through programs that build healthy spirit, mind, and body for all. Fundraising efforts are concentrated around those children who need assistance in after-school programs, summer day camps, youth sports, and cancer survivor programs. The North Texas Community Giving Foundation is dedicated to making an impact in North Texas by supporting local nonprofit organizations who align with the organization’s vision of improving the health, education, and welfare of our community. Since 2015, they have raised more than $150,000 in support of charities serving North Texas and have awarded grants to dozens of deserving organizations. TangoTab is a mobile app that works with over 100,000 restaurants around the country. Every time you “check-in” at a partner restaurant using the Tango Tab app, a FREE meal is donated to a person in need…. When you eat, they eat. Use promo code FRISCO when you download their app! During a trip with his parents to Austin, Jake (then 3), became curious about the many homeless people he saw while exploring downtown Austin. During the entire drive home, Jake and his parents talked about the issue of homelessness and what they could do to help. Five years later, Jake is still on a mission to help solve homelessness in America. The Orchid Giving Circle Fund at the Dallas Women’s Foundation is a group of Asian women pooling resources to provide community grants that support social change and services for North Texas Asians. The organization has an interest in Asian women-led social change projects and organizations with a goal to increase awareness of the local Asian population, community needs, and knowledge about philanthropy. NPower is a national nonprofit that offers an alternative fast-track to tech careers for military veterans, military spouses, and young adults from underserved communities in New York, Texas, California, Maryland, New Jersey and Missouri. The American Fallen Soldiers Project was formed to help provide comfort and healing to the grieving families of America’s fallen military through the provision of an original portrait of their fallen loved one that fully captures their appearance and personality. Despite his brave battle, young Jonny Wade died of cancer in 2015. Even on his toughest days, he believed he could make a difference. His greatest wish was that no other kid should have cancer and go through what he did. The organization seeks to honor that selfless wish with their mission to conquer pediatric cancer through research and political action, with an emphasis on responsible spending. The Miracle League of Frisco was created to make the experience of being part of a team possible for every child regardless of mental or physical challenges. The organization provides an opportunity for children to participate in a variety of team sports – baseball, soccer, bowling, football and cheer, basketball, and track – in a fun, safe and rewarding environment. With the abundance of non-profit agencies either based in Frisco or providing services in Frisco, everyone can find an organization near to their heart. Look for a cause that speaks to you and do what you can to give where you live. I would also love to see the Junior League of Collin County included! We provide services and funding for many of the other organizations you’ve listed. Thank you for compiling this list to make giving easy!